Baahubali 2, The Conclusion First Look, Hindi, Telugu, Malyalam, Tamil, Movie Releasing On 28th April. 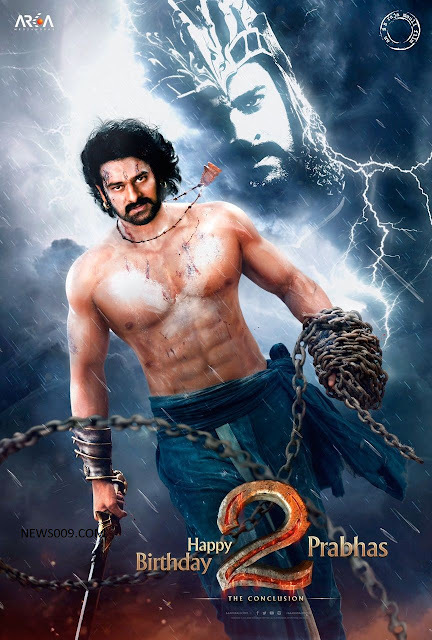 Baahubali is India's biggest movie and which is directed by great director SS Rajmouli who is from Hyderabad, Telangana. It changed the view of Indian cinema and told the entire world that we can also do a movie like 300 or war based movies with Indian technology. Part 1 released in 2015 june and collected around 500+ crores gross and 250+ crores share to distributors. Now they are releasing part 2 the conclusion on april 28th 2017. Few days back Director, Rana and Prabas set a pressmeet and told that they are releasing comic book and first look in this month. Tomorrow on 23rd it is prabas birthday on which they released today the part 2 first look. Also director told that they are implementing world's latest technology, Virtual reality to movie and they are specially releasing the movie with VR technology next year. They told that they are also releasing making videos and trailors with VR technology. News009 is estimating that part 2 may collect 600-700 crores gross worldwide.